The formation of a coalition of rebel groups under an “Islamic framework” that rejects the authority and legitimacy of the Western-backed and Istanbul-based National Coalition, is going to be widely seen as further evidence of the “Islamisation” of the Syrian opposition. On that basis, it will also generally be viewed as reflecting a trend towards greater extremism, but that judgement might be premature. The group which has not officially been named yet but is being referred to by some of its members as the “Islamic Alliance” appears to have coalesced around some core principles that seem to be more strategic than ideological, namely, that it rejects the authority and legitimacy of an exiled group that has assumed the role of a kind of government-in-waiting but whose members are safely removed from the fighting; that those who are fighting “own” the revolution; and that their success will depend on solidarity. An indication that this new coalition might not signal further radicalization of the opposition is the fact that it does not include the most radical group in Syria: the Islamic State of Iraq and al-Sham (ISIS) which is most closely affiliated with al Qaeda. Al Qaeda leader Ayman al-Zawahri recently called on Syria’s Islamist fighters to shun secularists, but this new coalition might have more to do with shunning outsiders. By raising expectations that a U.S. intervention might decisively tip the balance of power in the rebels’ favor, only to then see President Obama sign on to a chemical weapons disarmament plan whose most likely effect will be to ensure the continuation of Bashar al-Assad’s rule, the lesson that gets repeatedly driven home to Syrians is that there is no one they can rely upon but themselves. 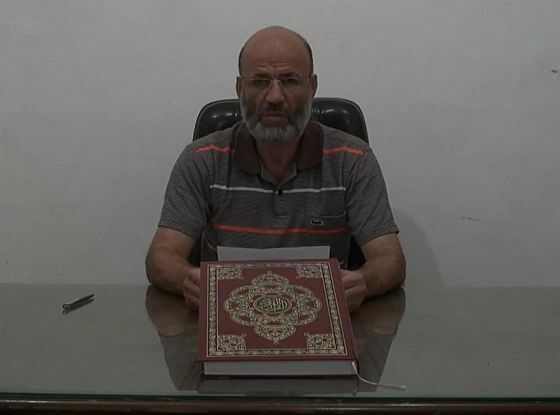 Aron Lund writes for Syria Comment: Abdelaziz Salame, the highest political leader of the Tawhid Brigade in Aleppo, has issued a statement online where he claims to speak for 13 different rebel factions. You can see the video or read it in Arabic here. The statement is titled “communiqué number one” – making it slightly ominous right off the bat – and what it purports to do is to gut Western strategy on Syria and put an end to the exiled opposition. All military and civilian forces should unify their ranks in an “Islamic framwork” which is based on “the rule of sharia and making it the sole source of legislation”. The undersigned feel that they can only be represented by those who lived and sacrificed for the revolution. Therefore, they say, they are not represented by the exile groups. They go on to specify that this applies to the National Coalition and the planned exile government of Ahmed Touma, stressing that these groups “do not represent them” and they “do not recognize them”. In closing, the undersigned call on everyone to unite and avoid conflict, and so on, and so on. The following groups are listed as signatories to the statement. The alleged signatories make up a major part of the northern rebel force, plus big chunks also of the Homs and Damascus rebel scene, as well as a bit of it elsewhere. Some of them are among the biggest armed groups in the country, and I’m thinking now mostly of numbers one through five. All together, they control at least a few tens of thousand fighters, and if you trust their own estimates (don’t) it must be way above 50,000 fighters. Most of the major insurgent alliances are included. Liwa al-Tawhid, Liwa al-Islam and Suqour al-Sham are in both the Western- and Gulf-backed Supreme Military Council (SMC a.k.a. FSA) and the SILF, sort-of-moderate Islamists. Ahrar al-Sham and Haqq are in the SIF, very hardline Islamists. Jabhat al-Nosra, of course, is an al-Qaida faction. Noureddin al-Zengi are in the Asala wa-Tanmiya alliance (which is led by quietist salafis, more or less) as well as in the SMC. And so on. More groups may join, but already at this stage, it looks – on paper, at least – like the most powerful insurgent alliance in Syria. Is this a big deal? Yes, if the statement proves to accurately represent the groups mentioned and they do not immediately fall apart again, it is a very big deal. It represents the rebellion of a large part of the “mainstream FSA” against its purported political leadership, and openly aligns these factions with more hardline Islamist forces. That means that all of these groups now formally state that they do not recognize the opposition leadership that has been molded and promoted by the USA, Turkey, France, Great Britain, other EU countries, Qatar, and – especially, as of late – Saudi Arabia. That they also formally commit themselves to sharia as the “sole source of legislation” is not as a big a deal as it may seem. Most of these factions already were on record as saying that, and for most of the others, it’s more like a slight tweak of language. Bottom line, they were all Islamist anyway. And, of course, they can still mean different things when they talk about sharia. Why now? According to a Tawhid Brigade spokesperson, it is because of the “conspiracies and compromises that are being forced on the Syrian people by way of the [National] Coalition”. So there. Mohammed Alloush of the Islam Brigade (led by his relative, Mohammed Zahran Alloush), who is also a leading figure in the SILF alliance, was up late tweeting tonight. He had a laundry list of complaints against the National Coalition, including the fact that its members are all, he says, “appointed”, i.e. by foreign powers. He also opposed its planned negotiations with the regime. This may have been in reference to a (widely misinterpreted) recent statement by the Coalition president Ahmed Jerba. Alloush also referred to the recent deal between the National Coalition and the Kurdish National Council, and was upset that this will (he thinks) splinter Syria and change its name from the Syrian Arab Republic to the Syrian Republic. Is this a one-off thing? The fellow from the Tawhid Brigade informed me that more statements are in the making. According to him, this is not just an ad hoc formation set up to make a single point about the National Coalition. He hinted that it’s the beginning of a more structured group, but when I asked, he said it has no name yet. On the other hand, Abdulqader Saleh – Tawhid’s powerful military chief – referred to it on Twitter as al-Tahaluf al-Islami or the Islamic Alliance, but that may have been just descriptive, rather than a formal name. Mohammed Alloush also wrote on Twitter, somewhat ambiguously, that the member groups have their own offices and political bureaus, and there’s a political program different from the National Coalition. He, too, hinted that there’s more coming: “wait for the announcement of the new army”. These are of course not all the rebels; far from it. Dozens or hundreds of small and local groups are missing from this alliance, just like they’ve been missing from every other alliance before it. Some really big groups are also not in there, like the Farouq Battalions or the Ahfad al-Rasoul Brigades, both of them quite closely aligned with the SMC and the National Coalition.